Was North Korea's No. 2 Killed For Not Clapping Hard Enough? : The Two-Way One reason North Korean leader Kim Jong Un had his uncle executed, some analysts say, is that he felt disrespected. The uncle, Jang Song Thaek, allegedly failed to applaud with enough enthusiasm when Kim was given a key post. It's also thought that Kim wanted to send a message: Don't mess with me. Was North Korea's No. 2 Killed For Not Clapping Hard Enough? -- There seems have been "a lot of genuine personal dislike" between Kim and Jang Song Thaek, the uncle and until this week North Korea's second most powerful man. Kim may have been "angry that his uncle disrespected him," Frank said on Morning Edition. According to North Korea's official news agency, Jang clapped "half-heartedly" when Kim was elected vice chairman of the country's central military commission. -- Kim also may have wanted to send a message to others in the regime that "no one is safe ... don't mess with me." 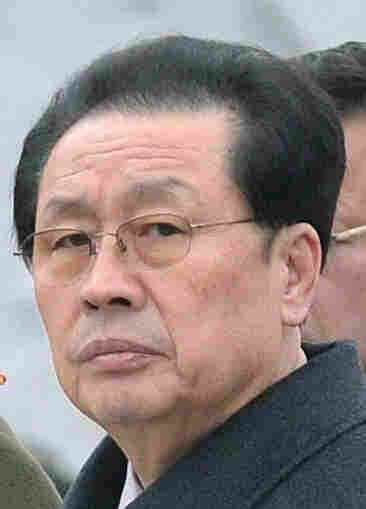 Officially, as we reported Thursday, North Korea's news agency says Jang was found guilty of treason. He allegedly "brought together undesirable forces and formed a faction ... and thus committed such hideous crime as attempting to overthrow the state." In South Korea, the Yonhap News agency reports that "Seoul [is] wary of provocations by North Korea after Jang's execution." "Unification Minister Ryoo Kihl-jae said the recent purge is likely to be followed by military provocations, including a nuclear bomb test. Touching on the speculation that the North will soon conduct their fourth nuclear test, the minister said in a parliamentary meeting, 'That is probable. We are keeping an eye on such a possibility.' "
This news reminded our colleague Scott Neuman of a chilling passage from Alexander Solzhenitsyn's The Gulag Archipelago, which described why you did not want to be the first person to stop clapping at one of Josef Stalin's rallies. Update at 10:45 a.m. ET. "Everything's Not Normal" And A Possible Setback For Any "China-Style Opening." -- "Most analysts ... think this was really a power struggle. ... Kim seems to be trying to consolidate his power" after about two years in charge, Frank says. -- Bloody purges are not common in North Korea. "People do get sacked all the time," says Frank. But, analysts say it's been decades since a senior Communist Party leader was executed. -- "Victor Cha, a former senior White House adviser on Asia, warned that Kim Jong-un's purge could spread further than Mr Chang," the BBC writes. "If he has to go as high as purging and then executing Chang, it tells you that everything's not normal," he said. -- "North Korea's execution of the man in charge of its relationship with top ally China may reduce the chance that the isolated nation adopts the embrace of markets that has seen its neighbor build a middle class," says Bloomberg News. "Jang represented a China wing of the leadership that was very close to China and was moving the country toward Chinese-style reforms," Charles K. Armstrong, history professor at Columbia University in New York City, said in an email sent to Bloomberg. "Jang's removal suggests that there are serious differences within the North Korean leadership about economic reforms and the direction of the country."